Also once in a blue moon, I finish a book and am left with some ideas or views that I keep thinking about in the subsequent weeks. Usually, such bookreading side-effects simply dissipate over time. But now that I’ve adapted Ryan Holiday’s notekeeping system into something that works for me, I actually have those thoughts written in my notes. And since I both devoured his latest book, and had some lingering thoughts, I thought the least I could do was steal kleinbl00’s title scheme and discuss them with y’all. The story that I knew was that Thiel conspired against Nick Denton by funding the Hulk Hogan lawsuit in secret, which finally brought down the wretched hive of scum and villainy that was Gawker Media. So on the surface, Conspiracy looks like a book that really doesn’t need 300+ pages. And, truth be told, it could’ve been significantly shorter if Ryan Holiday didn’t try to throw Memorable Quotes™ in every. single. place. he could. But what becomes clear after a while is that the simple story I knew depended on an array of people, places and stupid decisions. All of which could’ve collapsed a long, complex and actually pretty darn intriguing conspiracy that pitted a seemingly unmovable object (Gawker) against an unstoppable force (Thiel’s money). In the left corner: Gawker, representing an absolutely reactionary and unflinchingly nihilist view of journalism. All that matters is clicks and any shred of decency, especially towards people with any kind of power, must die. In the right corner: Peter Thiel, a relatively unknown libertarian tech billionaire back when Gawker outed him, was not just enraged by this personal hurt, did not only think Gawker represented a threat to society and privacy, but was also one of the few people rich enough that throwing millions around for a good cause represented chump change. The final blow didn’t have to be Hogan’s case – it just so happened to be the kind of person who had lost pretty much everything he cared about and was ready to fight tooth and nail for revenge. Gawker never saw it coming. Even when they were facing a $100M death sentence, they insisted that they could wiggle their way out of it – like they had done in every lawsuit before – because they thought they had a fundamental, freezed peaches right to be awful. They could totally have frayed the bond that kept the conspirators together if only they had a shred of empathy and competency. 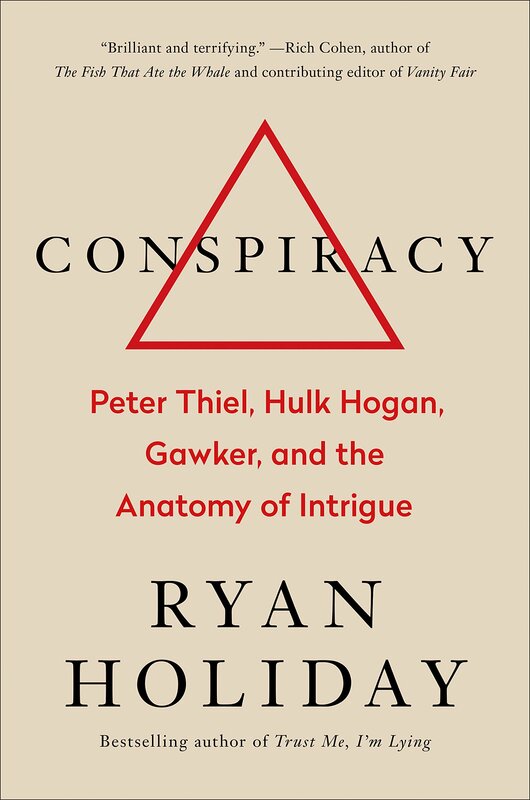 Unlike so many conspiracy stories, pretty much everyone involved in the story shared their point of view with Ryan Holiday, and nobody is spared of scathing criticism. And unlike many conspiracies that stay hidden, with this one it is glaringly obvious what unintended and ripple effects it has had. Thiel used a secret conspiracy to protect his and others’ privacy, but ended up famous and hated. Because of this lawsuit, Thiel realised just how much hatred and disillusionment was brooding among Gamergaters and Florida housewives against metropolitan folks like him, which led to his involved in the alt-right and the Trump campaign. On the positive side, because of this lawsuit and the Fappening (which was done partly by Gamergaters), the media in general slowly came to its senses and stopped the never-ending stream of raunchy upskirts and life-destroying leaks and reveals. Thiel’s original goal, to destroy Gawker and return to a less insane media landscape, was successful. What would the world look like if more people conspired to change things they thought were immoral? Perhaps it reflects a lack of faith in the regular, democratic means of trying to achieve Great Things, perhaps it is an echo of Ryan’s earlier (amazing) book Trust Me I’m Lying, but I am more and more convinced that a few well-placed strikes in a long-term and steady course might be a much more effective path to actually getting something done. And this book feels like a testament to that idea. Interesting review. Thanks for writing it. "I’m inclined to answer the question with “better”. I don't think I've ever heard the word "conspired" in regards to this question, but it's a question I think about a lot and always love to hear what other people have to say. If you're willing, I'd love to hear more of your thoughts in regards to this question. Yeah. It's a really interesting question, isn't it? On the one hand, I think conspire or not, secret or not, that if people strive for betterment, more often than not that'll be the end result. Provided they do it with care and conviction. I think one of the interesting things to question is, is striving to do good in secret a good way about it? On the one hand, I think transparency is an important tool because if you're open about what you're doing and why, no one can claim anything bad about your efforts. On the other hand though, if you're open about what you're doing and why, maybe it makes it easier for others who disagree with you to interfere with your efforts. Like I said, I don't think I've ever heard the word "conspired" in reference to this kind of question, usually because "conspiracy" tends to have a nefarious connotation.